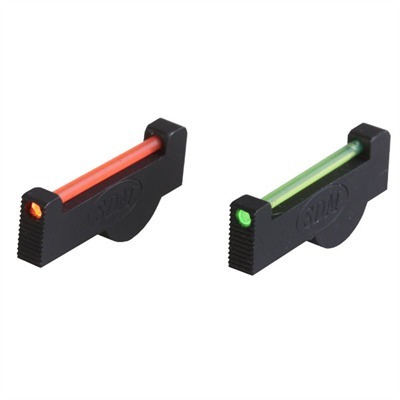 One inch long, fiber optic rod gathers lots of light, creating an exceptionally bright sight picture even in low light conditions. Base is wire EDM'd with 50 lpi machined serrations on the rear face. Extra height works with higher than factory, aftermarket rear sights. 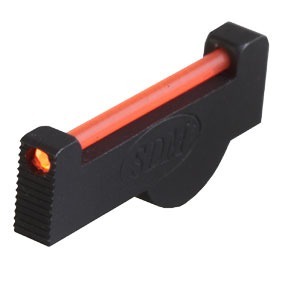 Works best with Millett .360" and .410" rear sights. Pin fits all Smith & Wesson revolvers with pinned front sight. SPECS: Steel base, black, matte finish. 1" (2.5cm) long, .125" (3.17mm) blade width, .300" (7.62mm) high.